Save 10% with this coupon. Enter code GA2K7QQB at checkout. 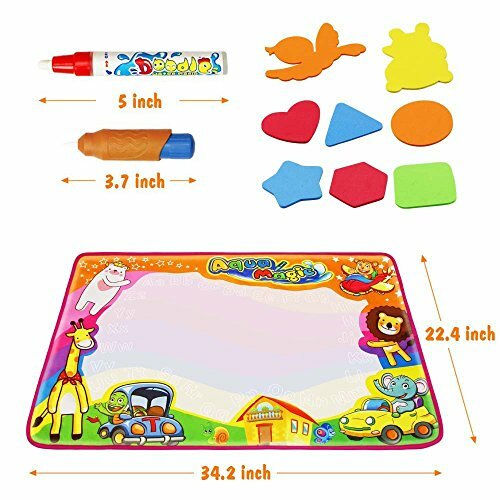 Ubetoone Aqua Magic Mat Kids Toys Water Doodle Drawing Pad Large for Boys Girls Toddlers Gift Size 34.6 X 22.8"
NO MESS coloring for kids: Ubetoone water drawing mat is clean and safe for children. The kids can color and doodle with water on the drawing mat .no ink, no paint.Don’t need to extra cleaning. The back of the mat is water-resistant nylon material, no worry about wetting the floor. 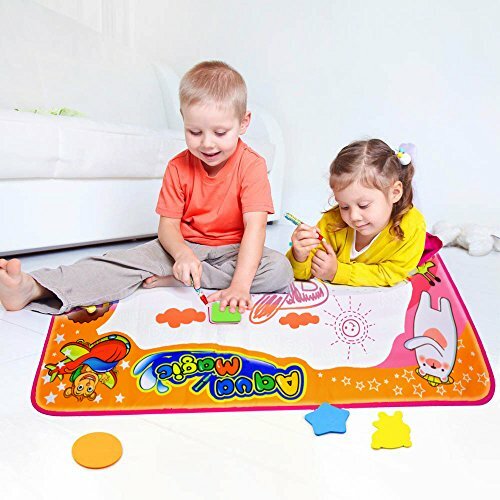 LARGE SIZE in 6 colors with 8 templates:34.6 X 22.8 inch.This doodling mat is enough for a couple of kids to play on.It can be folded to compact size, portable for indoor outdoor and travel. 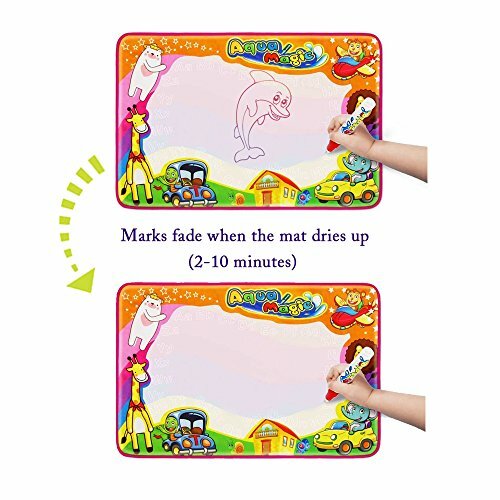 REUSABLE:Just fill up the pens with clean water and draw on the mat.The marks fade when the mat dries up after 3-10 minutes (depending on the temperature and air flow), kids can draw on doodle board mat again and again. Non-toxic, Non-polluting. 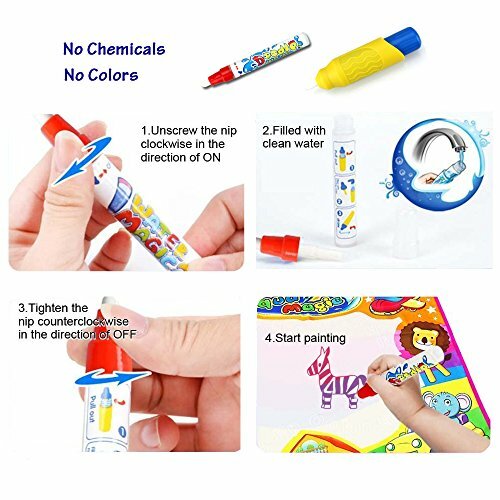 Ubetoone Water Drawing Mat: PAPER FREE,INK FREE.Don’t wish to waste papers or ink.Let your child color without worrying about crayon, marker, or colored pencil marks in every single place the walls or furniture.The best safety doodle toys. Smart Design:Let your child play with water and not make a massive mess.Save parents so much trouble. Large Size:It is enough for a couple of kids to play on.Portable for indoor and outdoor. Great Educational Gift:A good choice for kids that love to color or draw,exercise children’s hand-eye coordination. Comunication between parents and children:Cultivate a more intimate parent-child relationship. Endless Fun:No matter where you are, your kids can easily play on the road a few hours of entertainment! 1.Unscrew the nip in positive direction (ON). 3.Tighten the nip in negative direction (OFF). 1.It is better to put the head of the pens into water to soak for 1-2 hours before the use of. 2.The mat can only be written with clean water. 3.You’ll be able to wipe the surface of the canvas with a damp cloth, then air-dry it.Not machine wash, keep away from the heat. Ubetoone provide a Total 100% SATISFACTION GUARANTEE with your purchase.Contact us if you meet any problems.Buy Now With Confidence to start enjoying it. 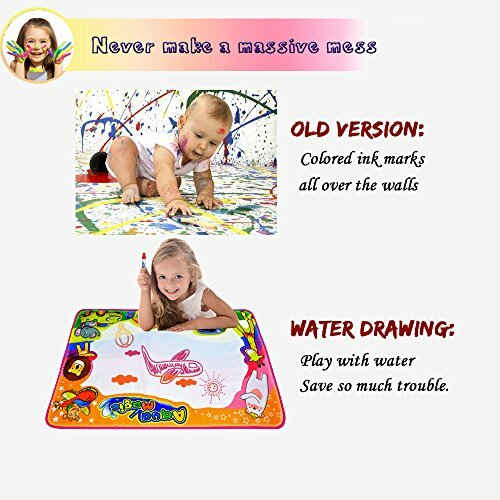 NO MESS coloring for kids: Ubetoone water drawing mat is clean and secure for children. The kids can color and doodle with water on the drawing mat .no ink, no paint.Don’t wish to extra cleaning. The back of the mat is water-resistant nylon material, no worry about wetting the floor. 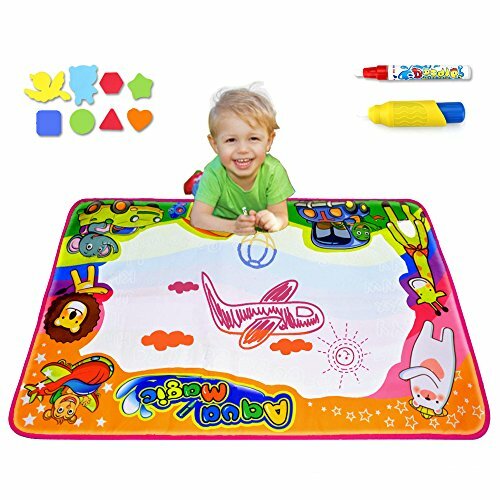 LARGE SIZE in 6 colors with 8 templates:34.6 X 22.8 inch.This doodling mat is enough for a couple of kids to play on.It may be folded to compact size, portable for indoor outdoor and commute. 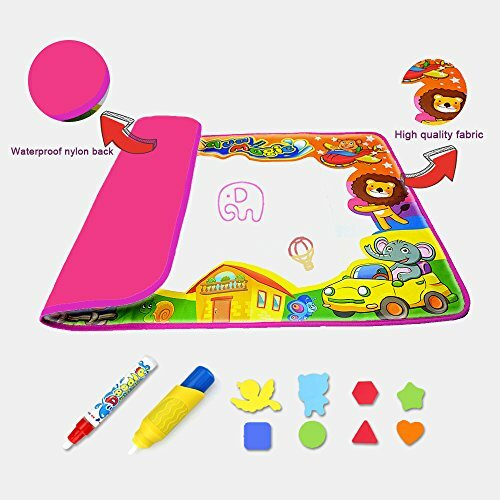 REUSABLE:Just fill up the pens with clean water and draw on the mat.The marks fade when the mat dries up after 3-10 minutes (depending on the temperature and air go with the flow), kids can draw on doodle board mat over and over again. Non-toxic, Non-polluting. 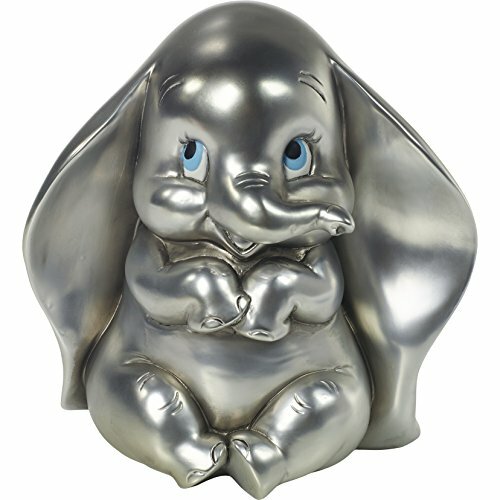 BEST GIFT for kids:Not only a toys but also a communicative link between you and baby. 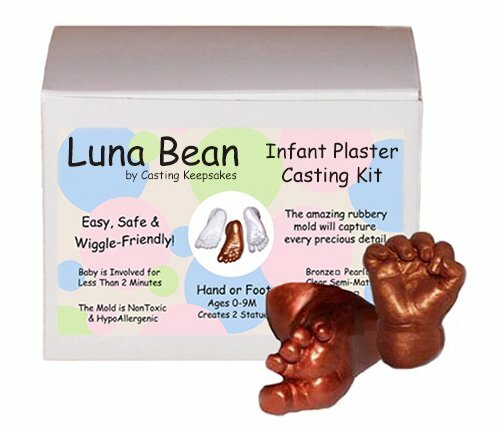 Inspire your kid’s creativity and imagination, exercise hand-eye coordination & the color perception ability.The best choice for kids Birthday gift or Christmas gift. Ubetoone 100% SATISFACTION GUARANTEE:Each product is backed with a one-year warranty and 100% Satisfaction Guarantee.Any problem you encounter,please feel free to contact us.You’re going to take NO RISK if you order now via clicking the orange “Add To Cart” button on this page!